Scott: I’m Scott Edwards, and today, I have Charles with me, to discuss the three costly blind spots most dentists miss, that keep them from attracting more ideal local dental patients. Charles is the founder of Dental Marketing Expert; a company which specializes in local marketing for Australian dentists, and is responsible for many dental practices across Australia, dominating their local competition and attracting up to 15 new patients each and every week. Welcome to the show today, Charles! Scott: Charles, what is the first of the three costly blind spots most dentists miss that keep them from attracting more ideal local patients. Charles: The important one, which we actually just have been talking about today, is overspending on traditional media. I’m currently on the Gold Coast and I do have a Yellow Pages, the printed book. What a surprise! So I opened in the dental section and I’ve seen some half-page ads. What do you think that costs, Scott? Scott: I think, from record, they’re still spending in the vicinity of $10,000 to $15,000 a year. Charles: Don’t you think that’s overspending for what you actually get? Scott: Absolutely! I don’t think I’ve seen a printed Yellow Pages book for the last five years. Charles: So this is a good example of where you could be overspending money; $10,000 or even $20,000 you could invest in the other areas, especially online areas, in Google Local or on your website and to improve your conversion. That is where money is a lot better spent than on traditional media. Obviously, we’ve got other traditional media like radio, television, newspapers. What you need to do is to track your return on your investment. Traditional media is a lot less effective nowadays. Printed Yellow Pages, it’s basically dead. So, I would not go and spend $20,000 on that. There’s no point of even tracking it because I think you just going to get no results or very minimum for your dollars. If you look at the radio and TV ads and newspaper, well, you really need to track it. Firstly, the attention of the consumer, your patients have shifted to online. If you’re expecting the same results for your $10,000 or $20,000 with the traditional media, it’s not going to be the same as five years ago. So, it’s obvious … it’s a lot less effective. Would you cut all the offline? No, don’t, but you really need to economize your dollars. If it was up to me, I probably would not run the Yellow Pages printed ad. I might spend $50 or $100 a month on online with perhaps Yellow Pages. I will still track my results and make sure I’m getting good return on investment. If I’m not, I’ll cut that off as well. You really need to look at things like, let’s say, if you’re doing radio ads, you have to have a … We talked about this before, on previous podcast, you have to have a dedicated phone number … tracking phone number, as well as a dedicated landing page where you can track it, and simply run one campaign. Try to run the smallest possible budget to test it. So if it works, you don’t need to commit it for 12 months of 20 shows. You just do one, one test and then you see if you get return on investment of. If you don’t, you simply cut it off. The same with TV… not many dentists do TV… so I will not cover it too much. It’s just nowadays you will spend a lot more money and get a lot less bookings. Local newspaper … it could be one of your best options as well as perhaps having postcards delivered to your target audience, so that’s more targeted. I’d like to go into targeted audience offline. So more of … things like postcards, are really targeted. You can also do newspapers. Local newspapers are probably not as targeted, but it could be affective if you have a good offer. Perhaps you have a story written about you. Have a little editorial article in the local newspaper. That’s something I wouldn’t necessarily cut it off. I would definitely have that in my calendar or ‘to do’ list. So we’re not talking about a cutting off offline we just talking about cutting off certain parts of offline marketing which is basically not cost effective, which is dying. And in regard to what the consumer attention span is and you just need to make a decision at a certain point in time, okay, that’s not giving me any return on investment or it’s just such a low return on investment. Let’s cut it off today and let’s divert that money so when you look at the overall marketing budget, it’s more cost effective so you get a better return on investment because that is really what is important. If you’re spending $5,000 a month and $2,500 is really going on something that doesn’t generate any new patients, so why don’t you put the whole $5,000 in the area which is working. That’s how you get really good results. Scott: And Charles, what is the second of the three costly blind spots? Charles: The second one is … we will tackle this before, is Mobile-First. We had the whole podcast about this topic, please go and listen to this podcast, it’s really good. It’s got some great insights. I will try to recap that very quickly. Everything is on the mobile today. Half of your bookings are done on the mobile, right now. This year, there will be more. There will be 60% next year and 705. The desktop is shrinking … the tablet devices and mobile is growing. You wan to be in the area which is growing and you want to invest in it. You need make sure that your developer knows about it and it’s your priority at least if in your new web design or banner design and things like that. Mobile-first is something a lot of your competitors won’t be doing, so you’ll be ahead of the pack and that’s where you need to be. Position yourself where the consumer attentions span which is mobile. Especially the young consumers, they on a mobile phone all the time. They don’t watch much TV, some of them don’t have computers, desktop computers. They might have an iPad with a full screen browser, so that’s probably the market which still retains full screen browser. It seems to be that the mobile phones are getting better and better. I’m not your young consumer, I’m over 50. To be honest, I spend a lot more time on my mobile than I used too. A few years ago the mobile technology wasn’t that good, the screen wasn’t that big. Recently I have purchased new phone it has a beautiful big screen, takes good videos, great images and it’s a real pleasure to browse for information, search for a local business. Everyone is on a mobile in Australia. It’s not just young people. It’s not jus 20s, 30s; a lot of 40s, 50s are jumping on the mobile, and they’re basically enjoying it because it’s easier, it’s convenient. Specially social media, checking your emails, and doing a quick Skype call. The mobile-first, I think that just doesn’t get told enough. We don’t pay enough attention and if you look at it, half of your new bookings comes from mobile, you need to pay attention, definitely. Scott, don’t you think so? And lastly, the third costly blind spot most dentists miss that keep them from attracting more local, ideal patients, what is it Charles? Charles: Wow! I think that what everyone probably knows, where we’re going with that. It’s Google Local. That’s what we are passionate about and that’s what where we know where the future is … the future is the local market search. Is there always gonna be Google? Well who knows! We’re looking at Google Local right now, because they have dominated the market place. That’s over 80%, some data says 92%; but even if we say it’s only 80% of market share, you need to focus on 80%, not on 20%. I also have data in which I forgot to mention, which is interesting, we were just looking at this recently; there is a 20 to 25% of consumers who are on the mobile only. They never go to a desktop browser. That’s just amazing data, and that’s just gonna grow. It’s very important to know that. Also, we’re looking at the Local … the Google Local is mainly accessed via mobile phone. Your local searches … of 50% of local searches, there’s some various data, I’ve looked at all different sources, there were anywhere between 50% and 80% are local searches done on mobile. Let’s just look at our own statistics. When we look at our current clients, half of their bookings comes from mobile devices. That’s pretty good start, so we can definitely say that focusing on Google Local and mobile first is critical. Google Local itself, as I said, really works well with the mobile. You need to make sure that yes, you’re visible and then you’re set up for the high conversion; so conversion to call and to bookings. This concludes the three biggest mistakes dentists make… Let’s embrace those new technologies; let’s embrace mobile first; let’s embrace Google Local, and let’s try to minimize on spending on traditional media and really track well your return on investments because it’s very expensive in comparison to the online marketing. Now, if any of the listeners would like to take advantage of my 15 minutes triage call; they can simply go to https://dentalmarketingexpert.com.au/call, and they can schedule a 15 minute call. And on that call, we just go through everything. We go through your digital assets; we look at your security; we look at your website, do you own your domain? I’m happy to give you some hints on how to transfer to your own name. If you have any assets which are hanging and you’re not sure how to deal with that? Perhaps you bought a new practice and something is hanging? You don’t know how to transfer from other dentist name to your name? We’ve dealt with this kind of issues on the weekly bases. We have the experience! I am happy to share those insides on the call. Let’s build your blueprints, let’s have a look at it! What’re your return on investments are, in the traditional media and in your digital media? Let’s build good system. a local marketing system, so you future proof, and your competitors ….they’ll basically be scratching their heads and thinking, what happened? We will position you as a go to dentist for your local area and you will win this game. 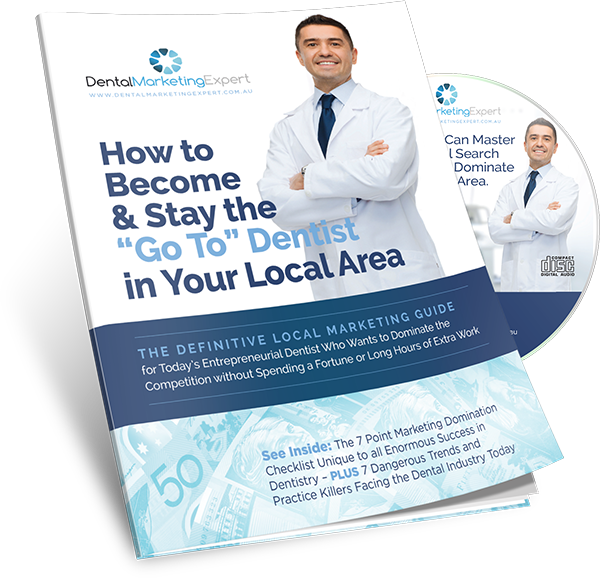 Scott: Once again, that website, to take advantage of Charles offer of a no obligation, free, local marketing triage call is: https://dentalmarketingexpert.com.au/call. Simply enter your details and select an appointment that suits you. 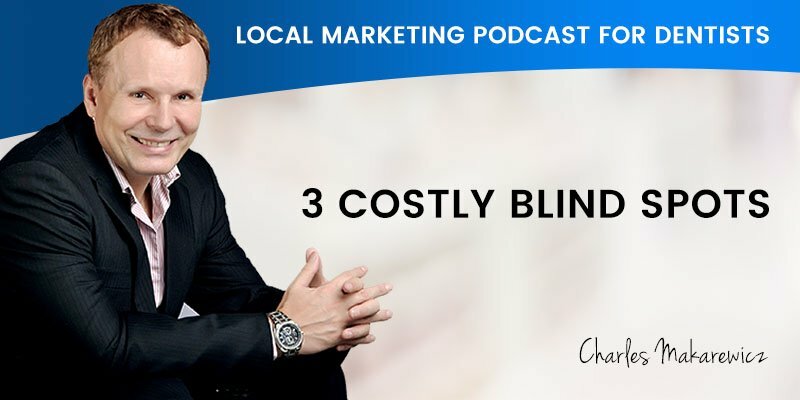 Charles, yet again, you’ve provided some great information and given a lot of ideas about how our listeners can avoid the three costly blind spots most dentists make, that keep them from attracting more ideal local patients. Well that wraps up today’s podcast folks and concludes this series. Stay tuned for our next series coming soon, where we interview a select group of well known industry experts and acclaimed success coaches and provide valuable content to continue your education.